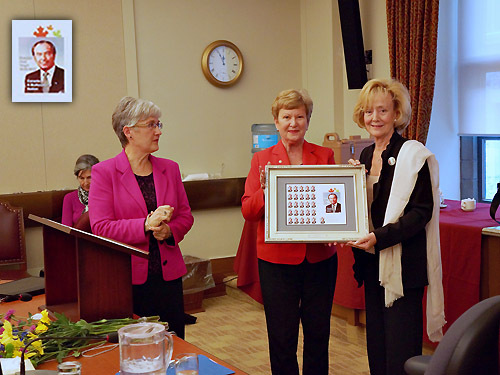 On Thursday, October 24, the release of a new stamp commemorating the late Honourable Paul Yuzyk was celebrated at the Senate of Canada. Senator Yuzyk is recognized for his role in underlining the contributions of all Canadians in the nation-building process and in establishing multiculturalism as one of the fundamental characteristics of Canadian heritage and identity. This year the Ukrainian Collectibles Society of Toronto, a Chapter of the Ukrainian Philatelic and Numismatic Society, undertook to design a Canada Post Picture Postage Permanent Stamp honouring the late Senator Paul Yuzyk for his role in shaping the history of Canada. The stamp will be officially released on October 26, 2013. “Senator Paul Yuzyk is best remembered as the father of Canadian multiculturalism. I am very pleased that since 2009, the Government of Canada’s annual award recognizing outstanding contributions to multiculturalism bears his name, and that his important legacy continues to be highlighted through initiatives such as this commemorative stamp,” said the Honourable Jason Kenney, P.C., MP, Minister of Employment and Social Development and Minister for Multiculturalism, who participated in the event. Senator Yuzyk’s daughters, Vera Yuzyk, Vicki Karpiak and Eve Yuzyk-Duravetz attended the ceremony on Parliament Hill. Also in attendance were Mark Stelmacovich, VP of the Ukrainian Philatelic and Numismatic Society; Ihor Bardyn, President of the Ukrainian National Federation of Canada (UNF); and Paul Migus, Director, UNF Ottawa-Gatineau. “The greater Canada that is in our power to make will be built not on uniformity but on continuing diversity,” he said. Senator Yuzyk also predicted that Canada would become a role model for the world facing similar immigration and integration challenges.